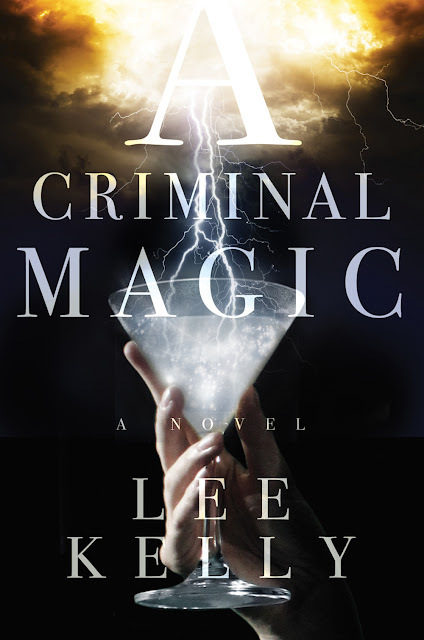 Criminal Magic is Lee Kelley's second book - after her acclaimed debut, City of Savages published by the Saga Press in Feb 2016. I did get a early copy back in Feb but I just had not got around to reading the same. So digging through my backlist pile, I decided to tackle this 'urban' fantasy set in an alternate America of the 1920's - magic, mobsters and mayhem! Potent mix that I didn't want to miss out on. And once I got started, I was cursing myself for not having got to this any earlier! When was the last time you enjoyed a movie where the hero is a bearded man-child who is a vagabond and hates responsibilities and lives the free happy life of a hippie. (Don't we all men yearn for this!) Where the heroine is a bright-eyed idealist who falls in love with the idea of a ghost based on a graphic novel. (Do girls like to be like this, I wonder?) And the story? A twisted pretzel of a meandering journey through bohemian lakeside towns and misty hill-stations laden with tea-estates and quaint old-age homes. Possibly never before. 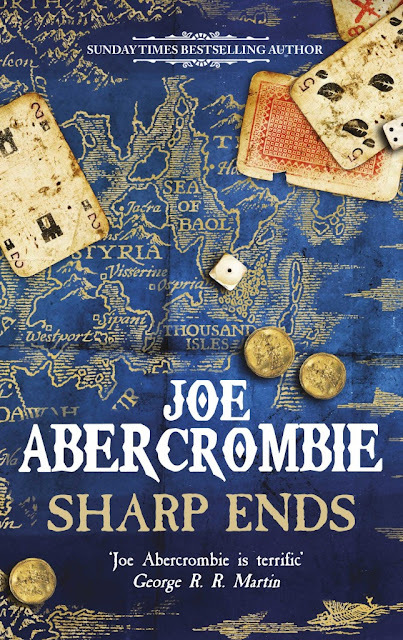 The world over is super excited by this upcoming release of Joe Abercrombie's latest, Sharp Ends - a return by the master of modern grimdark to the world of the First Law, featuring a motley collection of short stories about some of the best-loved and also lesser-known fringe characters from his earlier books. I was over the moon to have snagged a copy of an ARC and finished this off yesterday night, reveling in that besmirched, blood-spattered, double-crossing world, in his trademark writing that smacks of gallows-humor drenched in black about hopeless situations and also touching upon the futility of violence and war beautifully conveyed in that unflinching unapologetic prose of his. 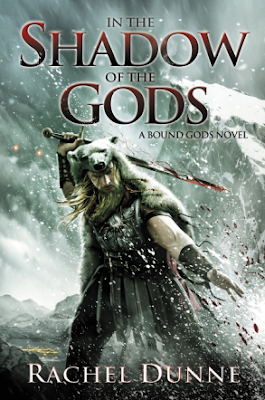 Continuing our Wednesday meme of highly anticipated new releases this year - our next big one that I am super excited about is : In the Shadow of Gods by Rachel Dunne from Harper Voyager, releases on June 21st. Fantastic cover and an awesome premise. I like meself a gang of mismatched no-gooders out to save the world from the wrath of powerful deranged gods! A breathtaking talent makes her debut with this first book in a dark epic fantasy trilogy, in which a mismatched band of mortals, led by violent, secretive man, must stand against a pair of resentful gods to save their world. Eons ago, a pair of gods known as the “Twins” grew powerful in the world of Fiatera, until the Divine Mother and Almighty Father exiled them, binding them deep in the earth. But the price of keeping the fire-lands safe is steep. To prevent these young gods from rising again, all twins in the land must be killed at birth, a safeguard that has worked, until now. 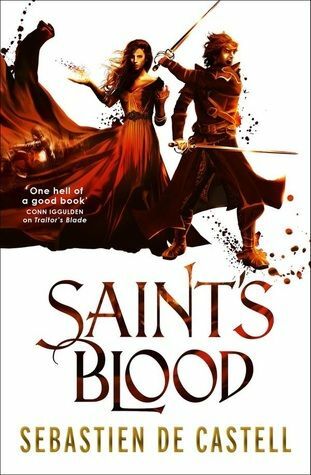 Saint's Blood is the third book in the Greatcoats series by Sebastien De Castell published by Jo Fletcher books. And man, this series continues to blow away my expectations to kingdom come - gleefully reveling in the 'swashbuckling' fun that has been forever the trademark, Saint's Blood continues to portray all the strengths of Sebastien as a writer - a potent mix of non-stop adventure, thrills and even darker moods amidst the heartwarming bonding between all the lead characters. Now that The Force Awakens has officially been accepted by the fans worldwide, I would like to see how this one goes down with those purists. Mind you, I personally think this side-story has much more potential that the mash-up part-VII that pays homage to older movies and the story-telling. The first trailer is out and it's a feast for eyes. The movie releases in December 2016. 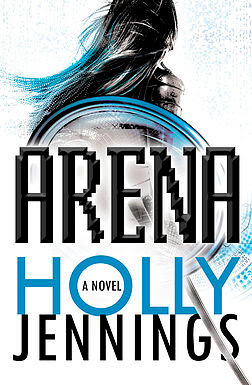 Arena is Holly Jennings' debut novel - a Science-Fiction/New Adult story that takes place in 2050 and positions sport-stars, more specifically video-gamers as celebrities in a world that is starved of fame and prefers to gloat over such professional video-gamers who have made it to the top in virtual reality gaming league championships. April is going to see some really wonderful speculative fiction books getting released - some debuts highly anticipated, some series conclusions, middle-books and game-changers!